Winona LaDuke, an Ojibwe Indian, is an internationally recognized, longtime environmentalist, feminist, and indigenous rights activist. She was vice presidential running mate for Ralph Nader's 1996 and 2000 U.S. presidential campaigns on the Green Party ticket. Through her speaking, writing, international conference participation, and activist activities, she has increased public awareness of the environmental degradation of Native American lands by nuclear and toxic dumping, water pollution, mining, and toxic exposure. She also builds support for self-determined solutions and protections that honor the cultural and spiritual values of Native Americans. Indian lands hold large supplies of uranium, coal, and timber, and the vast, isolated lands are attractive to industries searching for radioactive, hazardous, and other waste-disposal sites. LaDuke advocates for Native American environmental groups to wage a vigilant battle to protect their environment for future generations. She is the founding director of the White Earth Land Recovery Project and the program director of the annual Honor the Earth Foundation. 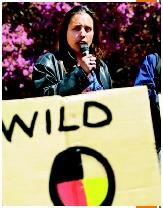 In 1994, Time magazine named LaDuke one of its "50 for the Future." SEE ALSO A CTIVISM ; E NVIRONMENTAL J USTICE ; E NVIRONMENTAL M OVEMENT ; E NVIRONMENTAL R ACISM . White Earth Land Recovery Project. Available from http://www.welrp.org .